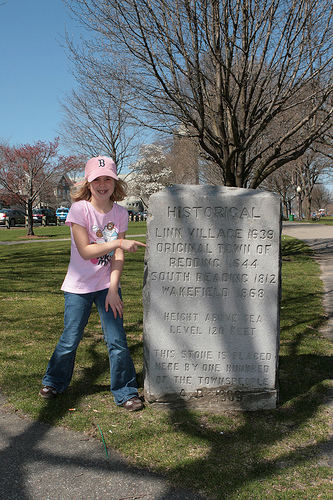 "As Sofia and I walked around town, taking pictures for the Library's Wakefield Then & Now Photo Contest, I thought of the original picture postcard of The Rockery, postmarked 1914, with a young boy in his coat and cap posed near the historical marker. Today, The Rockery has become a monument to the Spanish-American war and the historical marker has been moved across the street to the upper common. I marvel at the changes this boy must have seen over his lifetime, not only the physical differences in roads, houses, and buildings, but also the things that science and technology have brought to our day: modern medicine, radio, television, the internet. I wonder at things Sofia and those who come after her will see in their lifetimes. Will they be as different from our present time as we are from the little boy on The Rockery?" - caption provided by David Bruce, contest winner. 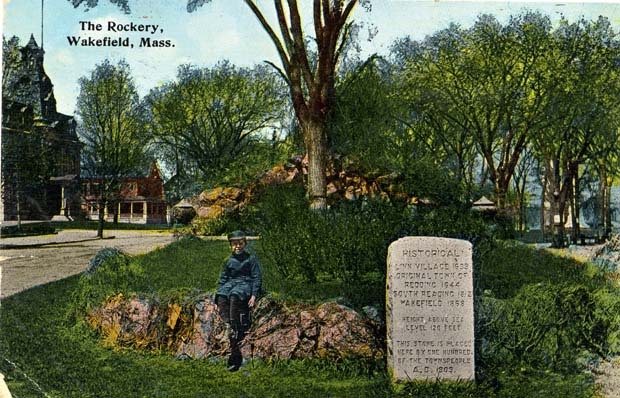 First photo is a reproduction of a 1914 picture postcard, looking north at the Rockery on Main Street opposite Yale Avenue. Second photo taken by David Bruce, March 2010. Bruce, David, “The Rockery,” NOBLE Digital Heritage, accessed April 20, 2019, https://digitalheritage.noblenet.org/noble/items/show/3799.